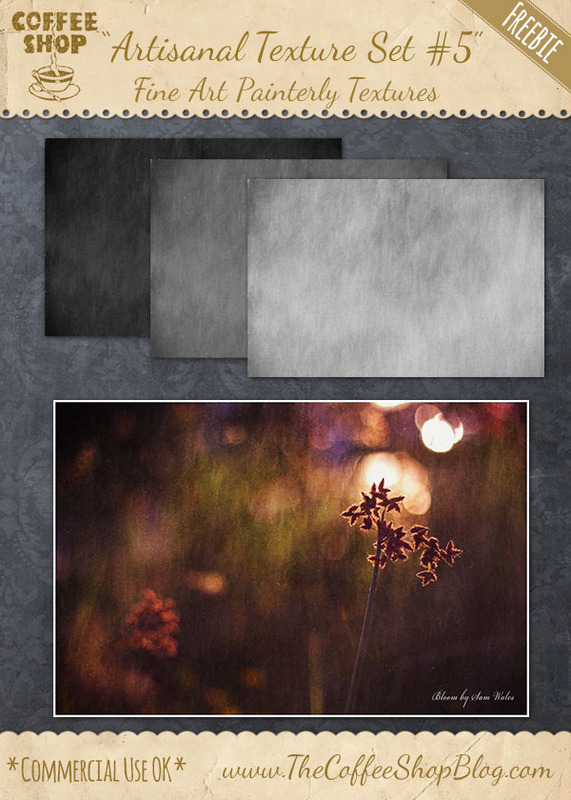 The CoffeeShop Blog: CoffeeShop "Artisanal Texture Set 5": Painterly Fine Art Textures! CoffeeShop "Artisanal Texture Set 5": Painterly Fine Art Textures! Today I have a beautiful set of fine art painterly textures to share with you. You can use these in Photoshop or PSE. Check out all of my textures here! I wanted to thank Bloom Photography for allowing me to use her beautiful image in my example above. I applied the medium texture two times in Soft Light blending mode. Download the CoffeeShop "Artisanal Texture Set #5". You can also download it here. Rita, thank you for sharing this with us! You are so welcome Kika! thank you! These are beautiful. Will make an ordinary photo spectacular! Oh yay...more textures. Thank you!